Follow along with Sweat Scene ambassador Michelle Rosenthal (Emory '16) as she shares her favorite Atlanta outdoor spots and not just for working out! Get Moving: It’s time to switch up your workout routine and check out some of Atlanta’s best outdoor spaces. Here’s the lowdown on a few favorites close to campus. 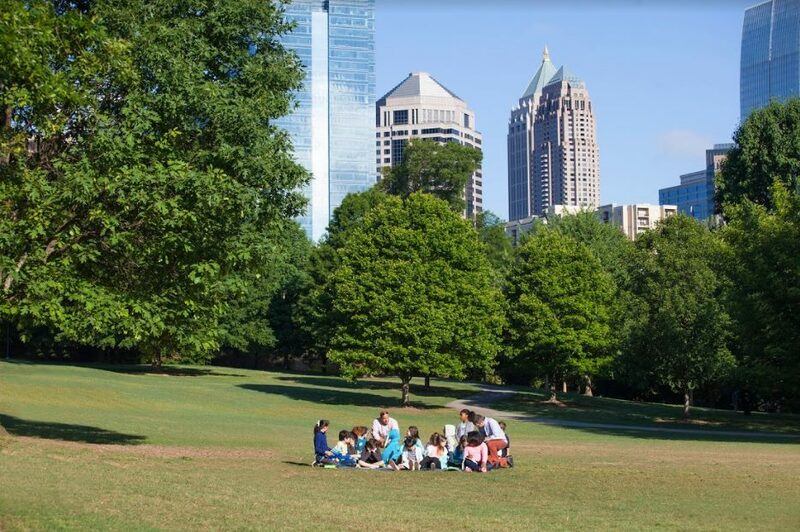 Located in the heart of Midtown, Piedmont Park is a trip you might want to save for the weekend. The park is always bustling with activity, and its 185 acres are perfect for running, biking, or just strolling. Amenities – Come with friends and play any sport your heart desires. The park has tennis courts, a soccer field, a softball field, volleyball courts, a running track, a swimming pool, basketball courts, and even bocce courts! Dog Lovers Unite – There are two dog parks located side by side, one for big dogs and one for smaller dogs. This is a great place to let your dog off the leash and play with some other pups! Rentals – Didn’t bring your bike to school? No worries. There is a bike shop called Skate Escape Bike Shop located right on Piedmont Ave where you can rent bikes by the hour. Green Market – This farmer’s market runs from 9am-1pm every Saturday through December. It's a great place to stock up on groceries post-workout or bring a blanket and have a picnic lunch! Blue Donkey – On Saturdays and Sundays, there is a Blue Donkey pop up in the park from 11am to 7pm. They have all of their flavors at this location, so feel free to mix and match and get your caffeine fix before or after your workout. The Atlanta Beltline spans 22 miles across a historic railway that wraps around the city of Atlanta. Though the Beltline is not fully completed, there are plenty of paved areas to work out, refuel, shop, and enjoy some fresh air. Brunch--There are tons of places to stop for a bite (or sip) before or after you workout. For brunch, try Parish, Ladybird Grove & Mess Hall, or Two Urban Licks. For coffee, Dancing Goats in Ponce City Market is a must. For juice, try Juice It Atlanta, Kale Me Crazy, or Lucky Lotus. Take the Scenic Route – As you keep moving, you never know what you’ll see! Keep your eyes peeled for awesome street art and sculptures as you make your way across the beltline. These unique displays provide great motivation to keep on sweating. Shopping – Paris on Ponce, located directly on the beltline, is home to over thirty chic boutiques! This is a great place to browse and even find some new apartment decor. P.S - Juice It Atlanta is located inside! Also, be sure to check out all the new stores that opened in Ponce City Market. Location – Since the beltline extends around Atlanta, you can warm up outdoors before attending your favorite Yoga class at CorePower Yoga or kickboxing at X3. The beltline even connects to Piedmont park if you want to hit two sites in one day! Located conveniently on Emory’s campus, Lullwater Park is the perfect place to work out before, after, or in between classes. The park is a beautiful and serene place to run and fit in your workout during a busy week. It’s Not the WoodPec – While the WooPec is great for running in place, Lullwater has trails that allow you to run through the outdoors and still make it to class on time. Surroundings – This park is full of natural beauty, with different varieties of trees and a small lake. There are tons of grassy areas to read, think, meditate, journal, or catch up with a friend. The Terrain – Lullwater has a nice mix of flat ground and hills, making it a great spot to test your resistance. Other Features – Lullwater is home to the President’s house which is a beautiful landmark to run by. Also, be sure to check out the suspended bridge and former powerhouse tower that still stands! **THE SWEAT SCENE is a great go to site for health minded college students featuring timely guides for staying fit and maintaining a healthy lifestyle written by a team of student ambassadors and contributors.